In 1993, a beautiful Kali image brought from India was ritually awakened by Sri Haradhan Chakraborty, the late main priest of the Dakshineswar Kali temple. He named her Sri Ma Dakshineswari Kali. Devotees who had very little background in the intricacies of India’s temple puja standards gradually adopted this vastly rich devotional tradition one detail at a time—out of a simple love and desire to please Mother. This simple daily worship grew organically into present-day Kali Mandir / Ramakrishna Ashram, where devotees can pour forth their hearts’ yearning to the Great Mystery at the center of existence. Kali Mandir is a shrine to the Divine Mother in a personal home on a private street in a residential neighborhood. Our ashram’s mission is to promote the traditional culture of Sanatana Dharma, to enable all devotees to come closer to Divine Mother Kali and to encourage spiritual values like modesty and respect. The way we dress and the way we act has an impact on ourselves as well as others around us. To help maintain the sanctity and purity of the mandir, we request that you follow our dress code, etiquette guidelines and hours. 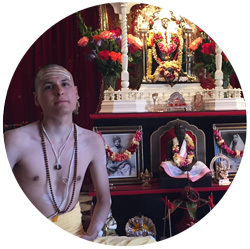 Kali Mandir / Ramakrishna Ashram aims to create a tangible spiritual atmosphere through daily worship, rituals, singing, chanting, volunteer service, scriptural study and spiritual discussions. Respectful of all religious traditions, Kali Mandir worships Goddess Kali in the mother/child relationship. Worship is conducted in a similar manner as that of the Dakshineswar Kali Temple in accordance with dakshina-marg or the right-handed path of Tantra which adheres to conservative Hindu norms in the mood of selfless devotion. No practices associated with a sectarian cult or left-handed forms of Tantra are performed. While devotees may have their individual gurus, there is no guru or personality cult here. Our ashram’s focus is on the awakened deity Ma Dakshineswari Kali and the universal teachings of Sri Ramakrishna Paramahamsa, Holy Mother Sri Sarada Devi, and Swami Vivekananda. Promoting traditional Goddess worship, we aim to remove misconceptions about such worship, propagating a spiritual culture that forms a bridge between East and West. We hope to inspire devotees to lead ideal lives of love and service. Though we have a close relationship with both the Dakshineswar Kali Temple and the Ramakrishna Math & Mission, Kali Mandir / Ramakrishna Ashram is an independent organization. We have no affiliation with any political organizations anywhere in the world. We have no membership and are financially supported by voluntary donations. A small portion of income is derived from our gift shop. Born in Vienna, Austria, Elizabeth Usha Harding (pictured here with Sri Haradhan Chakraborty) lived most of her adult life in Laguna Beach, California. In her professional career, she worked as a journalist covering the computer software industry. She wrote a book entitled Kali, the Black Goddess of Dakshineswar and was instrumental founding Kali Mandir in 1995. Since she retired from working as a journalist, she has dedicated her life full time to work for the Divine Mother Kali. Baba Bhajanananda is a devotee of Sri Ramakrishna Paramahamsa and Holy Mother Sri Sarada Devi. He met his Guruji, the late Swami Vishnudevananda Saraswati of Prayag (Allahabad) in 1987 and entered the renounced order in 1999, receiving formal monastic ordination (dasnami naga sannyas-diksha) from Swami Omananda Saraswati at the Triveni Sangam in Allahabad. He also received further initiations from the late Swami Chidananda Saraswati of the Divine Life Society and training in Kali Puja from the late Sri Haradhan Chakraborty. He has a Bachelors degree in Religious Studies from UC Berkeley and a Doctorate in Applied Theology from The New Seminary for Interfaith Studies in New York. When in India he stays at his guru’s ashram, the Yoga Vedanta Kutir. In the US he resides at Kali Mandir Ramakrishna Ashram, where he happily serves the awakened deity of Ma Dakshineswari Kali and Her devotees as Head Priest, Vice President and director of its seminary. Swamiji can be contacted at bababhajanananda@gmail.com. Baba Ambikananda is a disciple of the late Sri Haradhan Chakraborty (head pujari of the Dakshineswar Kali temple) and Swami Aparananda Puri (senior monk of the Ramakrishna Mission). He has been a student of Swami Bhajanananda Saraswati for more than 25 years. He received dasnami naga sannyas-diksha on Vashant Panchami 2011 at the holy Sangam from Swami Bhajanananda Saraswati and Swami Omananda Saraswati. Baba Ambikananda lives and serves at Kali Mandir Ramakrishna Ashram as Assistant Priest and Secretary and can be contacted at baba.ambikananda@gmail.com. Kamalakanta (Naren K. Schreiner) is a life-long follower and devotee of the great yogi Paramahamsa Yogananda (1893-1952). For fourteen years he lived as a monk in Self Realization Fellowship. With a deep love for Mother Kali and rich music dedicated to Her, he studied Indian classical music and Shyaama Sangeet at the ITC-Sangeet Research Academy in Kolkatta under Pt. Ajoy Chakrabarty. In 2012 he founded Sangita Yoga to preserve, present and teach the sacred music traditions of India. Trained in Kali puja by Swami Bhajanananda, Kamalakanta now serves the Divine Mother at Kali Mandir / Ramakrishna Ashram as Her devoted pujari. Br. 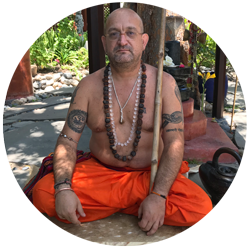 Atmarama is an initiated disciple of Swami Bhajanananda Saraswati and was ordained as a Dasnami novice monk and Kali Mandir pujari on Kartik Purnima in 2016. 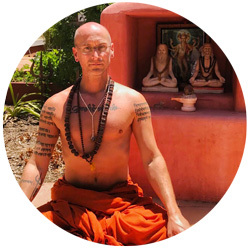 He currently splits his time between Kali Mandir Ramakrishna Ashram and San Diego County, where he is finishing his Associates degree in Philosophy, before continuing his higher education.